Third floor corner unit with one side all windows! View the ocean from your new queen size bed. Lovely upgrades include new furnishings, carpet and kitchen with all stainless steel appliances! Near Shopping, Restaurants and all beach activities. Farmer's Market, coffee shop and beach park 3 blks away. Swim and snorkel right in front of property within our protected outer reef. Observe a myriad of sea life including, sea turtles, dolphins and whales in season! Free nightly sunsets from your private lanai! 2 Propane gas grills for BBQing with a sunset view! "Talk story" with our local residents and meet people from all over the world at the best condominium Maui has to offer! 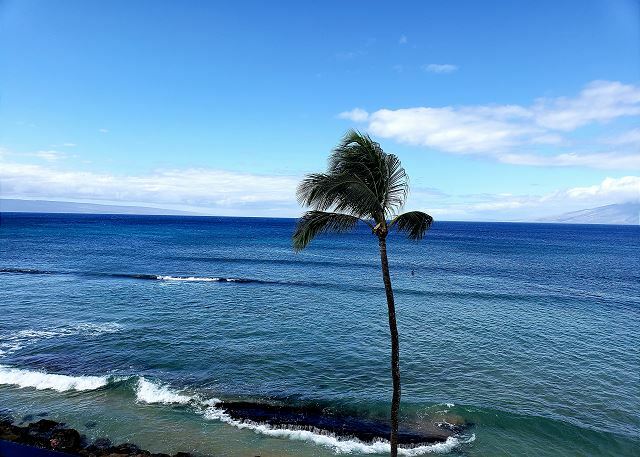 Hope F. from Lahaina, HI United States recommends this vacation rental. What a perfect condo for 2 people. It’s waking distance from everything we needed/wanted. The views are spectacular, we saw whales and turtles from the balcony every day - awesome! Lonnie was wonderful to work with. She rot in touch, offered her services if we needed anything. We will absolutely return and I’m telling all my Airline colleagues about this! Carol G. from Lahaina, HI United States recommends this vacation rental. Well maintained and decorated unit, grounds lovely and also well maintained. We had a lovely stay. The owners do need to upgrade the beach chairs but that was the only downside to the unit. Aloha Carol, So happy u enjoyed! See you next time! Robert W. from Lahaina, HI United States recommends this vacation rental. This was one of our best vacations ever! The weather, the view, the condo were all perfect. The condo was lovely and well-equipped. The side windows on the end unit made gave great ventilation and light and made the condo feel spacious. We loved having an in-unit washer/dryer and the elevator made moving luggage easy. The pool area was a great place to relax. We arrived tired and late and the condo had lights lit and a welcome note and made us feel right at home. A shout out to Lonnie the rental agent who was friendly, helpful, professional and talented. She added to the feeling that we had made a very good decision in choosing to stay here. We also appreciated the walkability of the condo: grocery, farmers market and restaurants were all within 3/4s of a mile. Mahalo for the comments and hope to see you again very soon! Victoria M. from Lahaina, HI United States recommends this vacation rental. Mahalo! See you next time! Corey M. from West Point, UT United States recommends this vacation rental. The location and service provided was excellent we woke up every morning to the crashing waves and watching sea turtles. We were also able to see whales out in the distance with the binoculars that they provided. There is no air conditioning, however it was not a problem because they provide fans and it never really got warm enough to the point where we couldn’t sleep it was always very comfortable. The only caveat is there is a picture of the bedroom with a TV, however there is no TV in the bedroom. It did not bother us, however if you want a TV in your bedroom this unit does not have one. Mahalo! Sorry about the TV! I will change pics! A guest from Christopher Lake, Saskatchewan Canada recommends this vacation rental. This was our second time staying in the Kaleialoha Condos, first time staying in unit #304. We were very pleased, it was perfect! It was nice to find that the condo was equipped with beach towels, a blender, binoculars, books and games! The only thing missing were steak knives and oven mitts ha ha, but I'm not complaining it was perfect! I accidentally locked both room keys inside one day but I had kept the lock code number in my phone (I knew I had a reason to do that)... so it was really nice that the extra key was there in the lock box and I didn't have to bother anyone to come! The condo was clean, bed was comfy, shower was wonderful. Overall it was great and we'd definatley stay in this unit again and would also recommend it to family and friends! Mahalo and be sure to ask for our repeat guest discount! Michael M. from Chillicothe, MO United States recommends this vacation rental. very nice condo, excellent location. Great views of the ocean, enjoyed the whale and turtle watching from our room. Very nice place, really enjoyed. A guest from Portland, OR United States recommends this vacation rental. This was our fourth stay in this unit. The view is amazing. The unit and grounds are well maintained. Being a corner unit it has good air circulation. It is ideally situated just north of Lahaina for day excursions up and down the coast. We enjoy going down the street to the fish market and cooking dinner on one of the common area’s barbecues. And as always, the property manager is always cheerful and responsive. Aloha Michele! So glad you keep coming back and enjoy your stay! 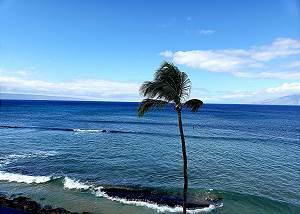 Brian G. from Lahaina, HI United States recommends this vacation rental. Excellent rental - the unit is well stocked and everything was nice and clean. The side unit allows really good air flow through the unit, keeping it cool. Bed was comfortable and there were two extra room fans to help keep air moving. This was the perfect place for us! A guest from Eagle Creek, OR United States recommends this vacation rental. Enjoyed our time here we enjoyed seeing the turtles everyday! This was a great location we had a great time. Juan P. from Lahaina, HI United States recommends this vacation rental. The apartment was great. We were three people and all good. We had spectacular views and a private beach area to freshen up. The terrace area the best, could leisurely breakfast and great rest , a quiet area. We have typically been resort travelers in the past. We tried the "condo" experience this time and won't EVER stay at a resort again!!! If you want to pay TOP DOLLAR for everything at a resort, have fun. However if you want the complete REAL Maui experience, then stay at this Condo Property and live the REAL experience of Maui!!! A guest from Tinley Park, IL United States recommends this vacation rental. The condo could not have been any better. It was very clean, well stocked with kitchen utensils and beach items. The bedroom was amazing with windows so we could hear the ocean waves every moment. It is in walking distance of the supermarket and farmers market. The location was perfect for exploring the island. A 45 minute drive to the south side activities and a short 15 minute drive to Lahaina shopping and restaurants. The best part?? Whale after whale after whale from our lanai. We would spend the morning with our coffee and newspapers spotting the whales breaching and taking videos. A wonderful memory. Jennifer F. from Wichita, KS United States recommends this vacation rental. Don and Elaine Q. from Carson City, NV United States recommends this vacation rental. The accommodations, the décor, the scenery and weather were all 5 star. The corner location of our third floor condo made for great viewing of whales, sea turtles, schools of fish, paddle boarders, surfers and boats. The sunsets were spectacular. We would definitely return in the future. A guest from Millington, MI United States recommends this vacation rental. This condo was so nice! It was exactly like the pictures. Perfect location, clean condo, and amazing views. Lidia C. from Hollister, CA United States recommends this vacation rental. For us, this property is in the perfect location. Just a very short ride to all of our favorite spots. We enjoyed watching the turtles from our lanai, and the little beach next door is perfect for a quick afternoon swim. The unit is fully equipped with everything you need, including beach chairs. We had a great time and will certainly return. William & Ida B. from Kennewick, WA United States recommends this vacation rental. View the ocean right out your door. See BOTH sunrises and sunsets (rare to find in one location). Nice beach and snorkeling right next door. If you go Dec - April you will love watching the whales. Owner is very nice to work with. We'd like to come back. Fred & Judy A. from Lolo, MT United States recommends this vacation rental. Above all it was pretty quiet. We come to get away from the noise and speed of modern life. We got a good nights sleep. My only suggestion would be to replace the carpet with tile (304). And update the artwork. A guest from Calgary, Alberta Canada recommends this vacation rental. Very enjoyable stay . Unit was well equipped and right on the ocean. The view was terrific and we could see sea turtles and surfers from the lanai. Many great beaches and sights to visit in the area. Office staff were very helpful in answering our inquiries. Great time!! Donnela B. from Westport, WA United States recommends this vacation rental. We love this place. Great access to everything for a perfect vacation. Love to sit on the lanai and watch the whales, turtles and spectacular sunrises and sunsets. Todd M. from mahtowa, MN United States recommends this vacation rental. Excellent location, well-managed, well-kept grounds, pool was immaculate, location was quiet, views were amazing. Would return in a second. A guest from Brooklyn, NY United States recommends this vacation rental. Our stay in Kaleialoha was so wonderful and made our holiday. I felt so at home and relaxed and had everything I needed plus more! Delighted!! Great Maui Condo at a Reasonable Rate! Randall & Janet S. from Port Orchard, WA United States recommends this vacation rental. We’ve stayed in three different units (which are individually owned), and they’ve all been nice, but we especially enjoy the corner unit #304 because there’s extra louvered windows along the living room and bedroom wall which let in lots of light, breezes, and views. The corner units generally don’t have AC, but we haven’t missed it. We appreciate having a washer/dryer in the unit and parking at no extra charge. Kaleialoha was built in 1973, an advantage over newer buildings because it’s built closer to the ocean than codes allow now. The building and grounds are well maintained. Condos are at three price levels: Deluxe (clean and in good shape but not updated), Superior (some nice updating), and Ultra (high end updating). We’d suggest going at least to the Superior level (such as #304). Excellent, relaxing with a superb view! Janis M. from Sydney, BC Canada recommends this vacation rental. We decided to try and stay part of our vacation in this area as we like to explore this end of the island. We are so glad that we did! We arrived late at night - the lights and fans were on with the patio door open to the sound of the crashing waves - talk about a perfect welcome! To top that off, there was a box of chocolates and a fresh pineapple waiting for us. We found this location so relaxing and quiet that we didn't leave the complex for 3 of the 6 days we were there. Just soaked in the views - turtles eating of the rocks, whales breaching, sunsets - couldn't get any better. Everyone who we spoke with, both owners and other vacationers were all great. The property is well cared for and very clean and manicured, BBQ’s were spotless. The unit #304 was a bit dated, but very clean and well cared for, this did not bother us at all. The kitchen is well stocked with everything one would need while on vacation to prepare meals, loved having the ice maker in the fridge. The lanai table and chairs were perfect to sit and eat every meal at while watching the horizon for breaching whales. There is no air conditioning, but we did not miss it as the breeze came through all the screened windows nicely, a benefit of being in a corner unit. You could see the ocean from most areas of the unit - would we return - in a heartbeat! There was a blind to block the sun on the lanai that was deteriorating and falling down - my husband just secured it - this should be replaced so it doesn't fall on anyone. Doug B. from Brentwood, CA United States recommends this vacation rental. Location at reef protected beach was perfect for snorkeling and watching turtles. No AC in the room, but fans cooled things off quickly. Does not have Sheraton amenities nor the price. Great comfort and relaxation. A guest from Patterson, CA United States recommends this vacation rental. We enjoyed our stay at the Kaleialoha #304. It was clean and well appointed with all of the comforts of home. We love the central location to all of our favorite beaches and restaurants. We have stayed there many times over the past 12 years and will return again on our next trip to Maui. Holly R. from Farmington, NM United States recommends this vacation rental. Loved the condo's location, really enjoyed watching the whales from our lanai! Corner room allowed air to move easily, keeping all rooms very comfortable. This was really important to us, since we thrive on air conditioning, and this condo had none. Great shower too! SIDDHARTH R. from FOLSOM, CA United States recommends this vacation rental. Unit was at an awesome location with easy access to beach, snorkeling and turtles turning up around the high tide time everyday. Farmers market and grocery stores nearby help in utilizing the fully equipped kitchen. Thank you for a pleasant experience staying on west maui. Sue G. from Walthamstow, London United Kingdom recommends this vacation rental. Robin A. from Canby, OR United States recommends this vacation rental. Had a fabulous time and we will come back next year.304 was the perfect unit for us. Lily D. from Berkeley, CA United States recommends this vacation rental. Joe M. from Issaquah, WA United States recommends this vacation rental. Brett g. from Ogden, utah United States recommends this vacation rental. We have the fortune of stumbling on to this condo and booked our room online in November. We have been to Maui several times and and not stayed in this location before, however with any good fortune we will be back!!! This condo has the single best view we have ever had on any stay on any island over the years of traveling to Hawaii! The condo was clean, acurate in all descriptions and reviews. We no complaints of any kind other than our stay wasnt long enough!! Everything we hoped for and more!! The fellow condo occupants were fantastic too! Many of them had been coming to Kaleialoha for 20+ years during this time and made everyone welcome as we arrived and had nightly "Happy Hour" out on the patio til sunset. That was a wonderful bonus to an already perfect time!! We look forward to returning and often!! A guest from Mequon, WI United States recommends this vacation rental. A guest from San Francisco, California United States recommends this vacation rental. Linda T. from Escondido, CA United States recommends this vacation rental. We came to Maui for our 15 year anniversary and unit 304 was recommended by a dear friend that has stayed there before. We loved it. It was clean, had a lovely kitchen and the lanai and view were nothing short of breath taking! Such a joy to have our coffee in the morning sitting outside looking at a minimum of 2 other islands. The local residents were so friendly, helpful and had a true Aloha Spirit. The grounds were so lush and immaculate. In the morning the care takers were on the ground level making sure every thing was perfect for the start of everyone's day. Having the ocean right outside our door was amazing. We sunned, swam and watched turtles. We did everything you can imagine from a Luau on our actual anniversary, snorkeling, sunset sailing, a PRIVATE tour of Hana in a gorgeous Escalade, and a sunrise on top of Haleakala! Oh, don't forget shopping (LOTS of shopping) and visiting the fantastic places to eat. No matter what we did we had a gorgeous and quiet place to come back to. Falling asleep to the sound of the ocean crashing on the shore was the perfect end to several perfect days. We will be back - no doubt about it. Fay M. from Huntington Beach, CA United States recommends this vacation rental. Lona B. from Santa Rosa, CA United States recommends this vacation rental. What a view. Loved sitting on the deck watching the whales go by. We spent 10 days and every day was perfect. Urvashi M. from Sugar Land, TX United States recommends this vacation rental. Great location, absolutely ocean-front, very clean, fully equipped kitchen, closer to restaurant and grocery stores. It was worth every penny!! Roman L. from Sherwood Park, AB, Canada United States recommends this vacation rental. It was not long enough. Hope to come longer next year. Sandy S. from Kirkland, WA United States recommends this vacation rental. Minutes to fabulous beaches, ocean side restaurants, shopping and farmers' markets. Of our past five trips to Maui we have spent the last three at the Kaleialoha. The staff is friendly and helpful, the only sound is the ocean and the building and grounds are spotless. From the ocean front lanai watch whales and turtles during the day and moonbows at night. Iva R. from Lahaina, OR United States recommends this vacation rental. It was amazing, beautiful sunsets..... I'd recommend another Gas BBQ .... and the room could of used a softer bed, and softer/bigger pillows.... overall, the experience was perfect. Kathy G. from Abredeen, WA United States recommends this vacation rental. We can't recommend the condo highly enough. The condo was clean and nice and intimate for us. What can be better then coffee in the morning on the lanioverlooking the ocean. Maybe watching the turtles feed in front of your condo every evening while you have dinner before sunset. I had read reviews that said the snorkeling wasn't very good on the beach in front of the condo. Couldn't be more wrong! The visiblity wasn't as great sometimes in the afternoon because of the surf but in the daytime until 2 or 3 it was terrific. We saw every kind of fish and even swam with the turtles. We can't wait to go back and rent the exact same condo. Oh by the way the shower was exceptional. As we had in the fall of 2010, we thoroughly enjoyed our stay at Kaleialoha. Unit 304 is perfect - lots of cool breeze, fabulous appliances and the lanai furniture was wonderful. Morning coffee and sunset cocktails were some of the best parts of the trip. Loved the grill and made good use of it. Swimming immediately offshore is refreshing, but the snorkeling is poor. Go down to Black Rock or Honolua Bay for superior experience. But having the turtles a few feet away at Kaleialoha was a daily joy. Only sour note this time - someone in one of the nearby units was smoking fairly regularly. We weren't able to pinpoint which one, so just told the office as we were leaving. Lonny was awesome and everyone friendly. If I thought there might be some problem (there never was) I had no reservations it would have been dealt with. The last day was just heaven. A guest from Millbrae, California United States recommends this vacation rental. A lovely, quiet place to stay. The condo (#304) was wonderful! Property is well kept, staff is friendly! And there are turtles everyday out in the waves! Great holiday,location,condo,and staff,also no rain,could have been longer,excellent manger. a time of real rest and relaxation. Walt Y. from United States recommends this vacation rental. Cut 4 branches from the palm tree so you may see a complete view of the ocean. We will be back. A guest from canby, oregon United States recommends this vacation rental. The location is perfect and the Condo is very nicely appointed. It is a great place to stay. 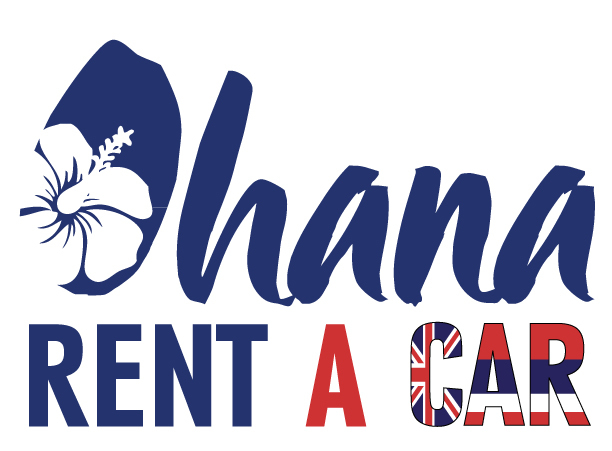 We will visit Kaleialoha Rentals again! Thanks! Joel W. from Longwood, Florida United States recommends this vacation rental. We've made 14 trips to Maui & stayed at many condo's over those years until we found Kaleialoha. Now we only stay at Kaleialoha & have highly recommended it to our friends. It has our highest recommendadtion! A guest from Encinitas, CA United States recommends this vacation rental. The location is nice. Its quiet and away from much of the traffic noise. An issue that we liked and at the same time didn't, mainly because we had to drive a bit to go out and eat or go for a swim. Aside from that, the location was nice. Best part is waking up and eating breakfast on the Lanai as you see the ocean and whales breaching. That was awesome. The unit is very clean and has all you need to make your meals and relax. We didn't need AC at all during our stay. Opened up the windows and let the breeze come thru. Crashing waves of the ocean sounds amazing at night. Some of the decor is a bit outdated, but then again you're in Maui to relax and be out on the beach, not stuck in your room. My only issue was that the bed was uncomfortable. Too soft, not enough support. Other than that, you cannot beat the views of this place. Makes for a romantic spot. Amazing beaches a short distance up for swimming and snorkeling, and then you always have the great beaches further south. Enjoy! Kim E. from Jannali, NSW Australia recommends this vacation rental. We stayed at Kaleialoha in Sept 2012 and decided to stay here again when we met some family and friends for a reunion. We spent most days lounging at the beach and swimming with the turtles. We found the best time to view the turtles was in the morning as the water was a bit cloudy in the afternoon. We stayed in unit 304 and absolutely loved being in a corner unit. We had windows in the bedroom that over looked the ocean and fell asleep to the sound of the waves every night. There was no need for air conditioning as we always had a nice breeze and for the really warm nights we used the ceiling fans. There were a couple of minor things that needed fixing in the unit and when brought to the attention of the Lonnie, in the office, she had them fixed the same day. The unit is fully equipped with everything you need and even an ice maker in the fridge. We congregated with our family and friends around the BBQ most evenings for dinner and enjoyed a beautiful sunset with a few drinks. This place really is a home away from home and such a relaxed atmosphere. The only negative I found was the distance from the main shopping area. The big shopping malls are over near the airport which is a 50 minute drive from Honokowai. Aside from that this is the perfect place to stay and I would definitely stay here again. Colin H. from Lakeville, MN United States recommends this vacation rental. It was beautiful. We arrived late so when we work up to the beautiful ocean we were amazed! We sat outside, ate our breakfast and watched the whales. Loved the condo. It was clean and very nice!We would highly recommend it!! A guest from Napa, CA United States recommends this vacation rental. great place in a great location. lots of whales and sea turtles to watch - right on the water. Friendly staff.